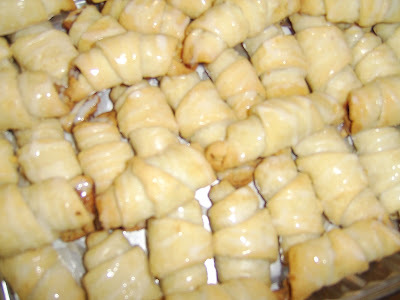 I made these cookies, also known as Rugalach, and they actually turned out really good. I got the recipe from http://www.tasteofhome.com/ It had chopped pears, brown sugar and walnuts in the center. I think they would be just as good if you substituted with your favorite jam or a cream cheese filling. Next time I will try it with strawberry jam. Yum. In a large bowl, cream the butter and cream cheese until light and fluffy. Combine flour and salt; gradually add to creamed mixture and mix well. Cover and refrigerate for 2 hours or until easy to handle. Combine brown sugar and cinnamon; set aside. Divide the dough into fourths. On a floured surface; roll out each portion into a 12-in. circle. Cut into 12 wedges. Place about 1/4 teaspoon cinnamon-sugar at the wide end of each wedge. Top with 1/2 teaspoon each pears and walnuts. Roll up, beginning at wide end. Place pointed side down 2 in. apart on ungreased baking sheets; curve ends to form a crescent. Bake at 375° for 16-19 minutes or until lightly browned. Immediately remove to wire racks. Combine confectioners' sugar and milk; drizzle over cooled cookies.